NOTE: Scheduled for most but *not all* 1st Fridays. Check sponsor's website for latest updates. 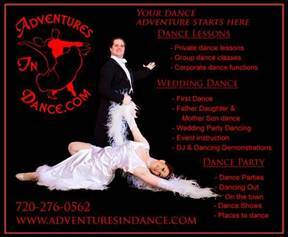 Conveniently located in Littleton, Colorado Adventures in Dance is a Partnership Ballroom, Latin, Swing and Salsa dance studio. We have a floating hardwood dance floor to add spring to your steps. Adventures In Dance teaches everyone from beginning dancers with two left feet to practiced steppers experienced in dance. We offer instruction to individuals, couples and groups, as well as special events. We even offer regular social dances each month.